Dance Of The Vampires : This musical "made in Vienna" does not have to hide from the Broadway and West End competition! For the first time, the United Stages Of Vienna have sold an entire in-house production in another country. Although this is cause for celebration for theater manager Rudi Klausnitzer, Vienna's musical fans are deeply mourning the production's departure. After all, the sale also meant that the vampires would be coming to an end in Vienna after only a two-year run and in spite of the fact that expectations have been fully met. The move from Vienna to Stuttgart was made with some trepidation. First the successful Viennese production threatened to become engulfed in the maelstrom of Stella's decline. Second, Stella had never been as successful in its casting as the United Stages. But there is nothing to be concerned about, after all. The Stuttgart production is well cast and, thanks to the many German speaking actors in the company, much easier to understand than previous musicals that have been staged in Stuttgart. Just as they have done in the Raimund Theater, the vampires continue to frighten audiences in the large, under-cooled Musical Hall. In fact, their sudden appearance in the theater's many balconies is even more impressive than it was in Vienna. Some stage scenes, however, continue to suffer from the fact that smaller details and Roman Polanski's finely honed irony are simply lost in the large theater. In addition to a few marginal changes (Sarah wears a different night gown and no longer looks quite as pregnant, and the lighting in Stuttgart, somehow, seems more disco-like), Roman Polanski, Michael Kunze and Jim Steinman have also inserted a new scene to replace the dream ballet with red boots in Act 1, for which the choreography was not particularly original. 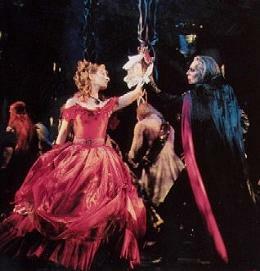 In this rock version, Sarah, after having sent Alfred into the house, sings about her longing for change in the song "Freedom Is Outside," while a few vampire couples dance in the background. 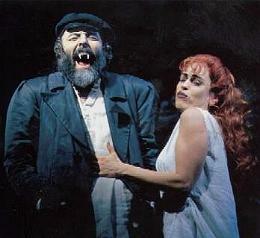 The scene is then transformed into a beseeching, chorus-like prayer scene involving the village inhabitants, including Rebecca and Alfred, against which Sarah and Krolock sing - a little heavy on the "Les Mis" pathos, but a strong image nonetheless. The production benefits from this scene, as it provides Sarah, a previously less animated character, with greater motivation and greater definition. This however, could also be attributed to Barbara Kohler, who is no longer simply the passive object of various desires. Instead, she appears more coquettish and lively, displaying a touch of girlish impudence that is attractive for humans and vampires alike. Although her voice sounds a little nasal at first, her interpretation of the role is definitely an improvement. Maaike Schuurmans is just as convincing in the role of Magda as grown-up Thomas Mulner is playing Herbert (although the Count's gay son could benefit from just a trace of self-mocking effeminacy, a little drop of blood, so to speak). In the role of Professor Abronsius, the personification of early science, Werner Bauer is also a hit with audiences each night when he delivers his tirade on "Truth." Nonetheless, he prompts some vampire fans to conclude that he "is not as good as..."
Audiences already expect quality performances from the four actors from the original cast. In addition to Anne Welte's audacious, sad Rebecca, James Sbano has transformed Chagal the Innkeeper into a true audience favorite, a man with a keen sense for dry Jewish humor and slapstick performances good enough for the movies. Once, again, Torsten Flach plays the back breaking role of Koukol with abandon. Aris Sas, with his excellent sense of timing, his beautiful and tragi-comically shaking voice, gives the timid-hearted Alfred a fine measure of irony without ever dragging the character into the realm of the ridiculous. Kevin Tarte, who previously played Gaston in Vienna and the Beast in Stuttgart, plays the leading role of the Count to full satisfaction. The only difference between his performance and that of his predecessor [in Vienna] is that Krolock's impeccable dignity seems studied in Tarte's case. This is evident in the dynamics that take place during the songs, the way he tosses his cape, and especially in his gestures. While Steve Barton was thoroughly sovereign, it seems that Tarte is still working on his interpretation. His Krolock is more aggressive and direct than in the Vienna version (which, certainly, is attributable to Polanski himself.) Although he takes a prosaic position at the center of the action, he does not appear to be overcome with the sorrow of the centuries gone by. Because he doesn't suffer, it is difficult to believe that he must be "reconciled with reality." In this respect, this role is similar to that of Lloyd-Webber's Phantom. The role is only well played if the nuances are performed well. Although individual dancers perform admirably in "Carpe Noctem," the ensemble, as a whole, lacks the Vienna production's snappiness and aggressiveness, partly because Adrian Werum's direction is slower here than in Vienna. Nevertheless, it is apparent that the actors are energized by the production, especially in the final sequence, and it is certainly conceivable that this cast will reach the standard of the Vienna production. Ultimately, one can do nothing but express one's unreserved admiration for this musical whenever it is produced, admiration for the successful adaptation of the book (which represents a clear improvement over the film version in some cases), Michael Kunze's fluid lyrics that consistently fit the music and frequently overflow with a wealth of ideas (such as the Professor's library aria), the even-handed distribution of humor and seriousness among all characters, both human and vampiresque, and the production's references to today, in terms of both Dennis Callahan's choreography, with its erotically charged aggressiveness and the cool shrugging of shoulders, and Sue Blane's vampire costumes with their allusions to leather-clad rock stars. Some features only become apparent on close inspection, such as Roman Polanski's obsession with detail in developing his characters and the ease with which he distributes flurries of silliness and slapstick across the entire evening. Aided by set designer William Dudley, he has applied his film director's eye for imposing images onto the screen. The concept of incorporating the auditorium into the action is also particularly effective in the theater and, parody or not, is effective in imbuing the audience with just a small amount of horror. Finally, the virtuosity with which composer Jim Steinman utilizes a wide variety of musical theater styles, the way he lends dramatic forces to partitives with his principal themes and how he, with the support of the whimsical arrangements of Steve Margoshes, Michael Reed, and Adrian Werum, allows the characters to develop from their music; Abronsius from music inspired by the likes of Rossini or Gilbert & Sullivan, Alfred from heroic and effusive romances, Herbert from an ironically light-hearted waltz, the melancholy Count from the quiet, aria-like lines of songs with their powerful crescendos, the vampires from their modernistic-grotesque funeral march and wild symphonic rock orgies. It is evident that musicals "made in Vienna" certainly have no reason to hide from their competitors on Broadway or in the West End. In fact, quite the opposite is true. Although "Dance Of The Vampires" was purchased for a great deal less than the price that was paid for "Miss Saigon" or "Beauty And The Beast," it certainly offers a higher standard. Unfortunately, the musical's arrival in Stuttgart coincides with the unpleasant aftermath of the Deyhle affair, which has involved such gaffes as the state of Baden-Wurttemberg's payment of DM 50 million to help save Stella. The topic of musicals is not particularly popular here at this time, and the vampires have arrived in Stuttgart at an understandably unfavorable time. One can only fervently hope that they will contribute to a much-needed recovery at Stella, that their new owner, Peter Schwenkow, will handle them with care and that, in spite of the current pessimistic attitude toward musicals, they will become as much of a success with audiences as they were in Vienna.